When I think of Sam Keith, I don’t think of anything even remotely mainstream. I know he did Marvel Comics Presents, and had his hand in annuals of Batman and other characters, but like Mike Mignola, I only think of what he did as an independent. My first thoughts are The Maxx. This huge, purple and yellow guy that lives in this bizarre fantasy world. But does it work though? Do the two worlds connect, and does one have as much to do with the other? Kieth’s art was anything but mainstream. To me, it was hard to look at at first, but once you got used to it, you saw things a little differently.You had glance into another world, and it was kind of weird. I’m getting ahead of myself though. Why don’t you jump with me down the rabbit hole as we take a look at Sam Keith’s the Maxx. It’s wet. Dark and wet. It’s the kind of weather that penetrates. Makes your skin feel itchy and oily. Maxx is muttering this to himself as his cardboard box soaks with rain. Fridge and Teego, two street thugs, one big, one small, are waiting for the nightly catch. They’ve worked out a deal with a cabbie. Cabbie brings them people to rob or murder, and the cabbie gets a third of the take. As Maxx says, sometimes it’s luck that can save somebody. Maybe it’s fate. Usually it’s fate, but sometimes it’s Maxx! Damn, inner monologue is actually outer monologue! Oh well, time to kick some tail and save the girl, right? Well, not exactly. To me, this is one of the most memorable and off beat openings I’d ever read in comics. When you’re so used to the standard super-hero origin and start-up, something like this can throw you through the loop. Sam Keith does exactly that with his plot. Just what the hell is going through Maxx’s head?! Is he a little off his rocker? Probably, but with the real world, which is portrayed as dark, wet, and gritty, the Outback (which at this point exists in Maxx’s mind) is very bright, and home of the Leopard Queen, who is also Julie in the real world. Kieth’s script keeps boundaries between both worlds, and though it’s, at times, very dark and disturbing in the sense that your imagination finishes what Keith makes you see off panel, there’s a great mix of humor in there too. Sam Kieth weaves it all together quite nicely, and really makes for a unique experience when reading the issue. Kind of like his art. With Sam’s artwork, it’s not something that just anybody would enjoy. You either love it or you hate it. I don’t think there is really an in-between on that. With his work on Incredible Hulk or Marvel Comics Presents, I just couldn’t get into it. I couldn’t see the likes of Hulk or Wolverine or Ghost Rider drawn as Keith saw them. 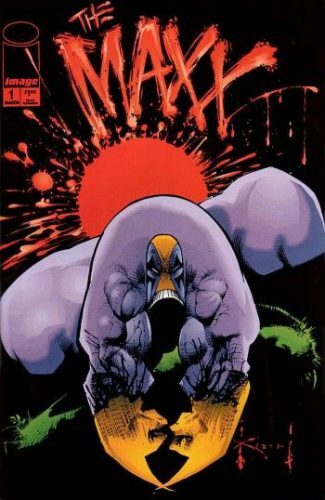 When Keith moved to Image and presented us with the Maxx, my opinion changed. For a story that comes from Keith’s own mind, of his own characters living in a world created by him, his artwork most certainly fits here. I can’t see Maxx drawn any other way, and the way he draws women really appeals. They’re not, well, fake looking. The way he draws Julie makes her look very real, or as real as anyone looks in a Sam Keith book, but that makes Julie all the more appealing. She’s not big chested with a super thin waist. There’s no other way I can really explain it other than she looks a helluva lot more natural than some of the other women that are drawn in comics. Kieth’s style is so visually appealing here, and it just makes everything look and feel natural. I can remember watching the animated series on MTV when it was out, and even comparing it to the comics. Nearly panel for panel, but as with most things, they left out some key elements. Maxx’s origin really never came in to play, but as I was reading it for this Back Issue Bin review, I could only hear the voice cast as I read the comic. That actually made it a better experience for me! It’s rare, even now, for a show based off anything to be that close to the source material. I think it’s pretty cool, and I’m glad that the animators gave that much of a shout to what the show was based off of. It’s a shame that both the comic series and animated series were so short. With 35 issues and 13 episodes… there could have been so much more to cover. Sometimes, stepping out of the norm of super-heroes is good, and in the case of the Maxx, it’s great. With such a wild imagination, Sam Keith takes us to a dark and twisted world, but at the same time, lets us laugh along with Maxx as he stumbles through life, jail, the Outback, and his interaction with Julie. Mr. Gone, let’s not forget him, or the Isz, who make Maxx’s life a living hell, but so long as we stay away from the mask, we won’t lose a finger. Oh, and no bubbles. Leave the bubbles out. Parental concern: Some mild violence. Thanks! I hadn’t read this in a while, and when I picked it up to read for the BIB, I had a much better appreciation for it than when I was younger. I’m still not a huge fan of Sam Keith’s artwork, but here, it gets a well deserved 9 because it fits so much. This, I think, is where Keith got the chance to really shine. I like Keith’s art. Especially his cover work. It got very innovative as the series progressed. Even utilizing actual mixed media on canvas. Did you ever watch the animated series? If not, it was really close to the comics. Nearly panel for panel in alot fo scenes! I watched a little bit if it yes. Very cool. When I think of 90’s comics this is one that always enters my mind, and I didn’t even have a chance to read it! Was always super curious, and wow, an animated series? I missed out! Check it out Chip! Full episodes right here! Hey, thanks a lot Tim! I’ll give it a look soon.